Summary: I picked out Barnyard Song book as a “theme” book for Summer Reading with no preconceived notions about its value. 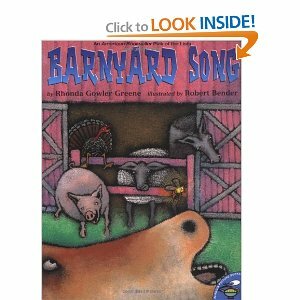 As I started reading it I was reminded of Barnyard Dance by Sandra Boynton which we have enjoyed many times. This book, though, becomes a bit more complex as the animals get the flu and the doctor is called. The rhymes and ensuing rhythm along with the animal sounds make this book fun to read, but the sneezing and wheezing combined with these elements develops into a hilarious scene that anyone who has ever been sick can imagine. Cons: The pictures are naturalistic/impressionistic making them a bit blurry. The Berenstain Bears’ Moving Day by Stan and Jan Berenstain gives a positive, yet honest perspective for children on moving to a new home. Frequent childhood concerns, such as toys, books, and friends are addressed. The bear family finds their new home location more comfortable, practical, and lucrative. More importantly, the family feels welcome in their new environment as their new neighbors offer housewarming gifts and hopes for new friendships. This Berenstain Bears book is one of my favorites by this author and would be a great book to read to any child facing an upcoming move or who has a friend who is moving. McDuff, a West Highland Terrier, and his “family” captivated my children’s imagination this morning. The 4 in 1 version of the McDuff Stories is a sweet book filled with captivating illustrations and telling simple, yet upbeat, page-turning stories of the adventures of the adorable pup. My children would not let me stop with just the first book. I whole-heartedly recommend this book for any dog-lovers or those who have ever wished they had a puppy. You may even consider visiting http://rosemarywells.com/wp-content/uploads/2012/01/McDuff-TeachersGuide.pdf for simple preschool lessons from these stories. This most recent Little House on the Prairie book that we finished followed the life of the Ingalls family through two happy, turned tough, years after they left Indian Territory. Years of attending school and church, grasshoppers, blizzards, times together and times apart take the reader on a roller coaster of empathetic emotion. We enjoyed learning of Pa’s ingenuity as he found ways to get food for his family and to keep warm. If you have watched any of the TV series you will enjoy getting to know the real Nellie Olson. After reading On the Banks of Plum Creek you will look forward to continuing to follow this family as they grow and move on to new challenges and excitement.